The point of any camping trip is to get out and enjoy the outdoors! And whether you prefer to spend your time hiking, fishing, or doing something else, that means you need delicious food to refuel and get the most out of your trip! But cooking in an RV or at the campfire is unique – so you need good recipes that are designed for the road. 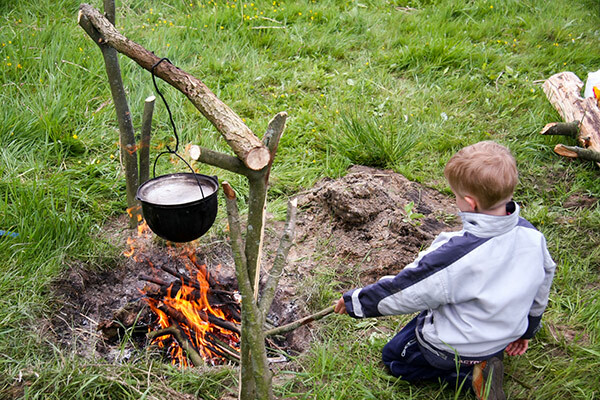 We found some of the best websites for family camping recipes! Check them out and find your new favorite meal around the campfire or in your RV’s kitchen. Each category is packed with tons of recipes that cover anything you could want: simple one-pot recipes, recipes featuring your favorite ingredients, and unique options for special diets. They’re all sorted alphabetically. Right now, there are over 1,000 recipes featured on KOA.com’s database! In addition to having a huge selection of family camping recipes, many of them are submitted by users like you! This offers a great variety for any taste. Dedicated entirely to outdoor cooking, Dirty Gourmet is a great resource when you want to create great meals around a campfire. Not only do they have high-quality recipes, they have them sorted by activity! Each activity’s unique recipes are made of ingredients and with tools you should be able to bring along. This means backpackers can plan to bring some studier foods that might survive the cramped confines of their bag, while cyclists can bring lighter loads that are easy to carry while biking! If you’re not worried about packing, they also sort their recipes by type. With categories ranging from appetizers, beverages, entrees and more, you’re bound to find something the whole family can enjoy. For family camping recipes, GoRVing’s database of campfire and grill recipes is hard to beat. In addition to being straightforward, with easy-to-read recipes, many of them come with mouthwatering photos to give you an idea of what you’re making. Like other popular recipe sites, GoRVing features many community contributions and you can easily submit your own too! One unique feature of GoRVing’s recipe list is the ability to filter recipes by season. If you need something special to help you keep warm in the winter, or a refreshing summer snack, it’s easy to find what you’re looking for. In addition to sorting by meal category, that gives you a lot of options to find the right meal for your family! After you’re done with your meal plan, you can also use GoRVing to find campgrounds and public land to travel to in every state. It’s an all-in-one resource! This straightforward site has a few hundred camping recipes ready to go. With recipes ranging from very easy to complex, there are plenty of options for experienced camping chefs or those just looking to grill a burger. Many of the recipes listed here are rated – which offers you a little insight on which recipes you might find more appealing. One useful feature of Camping Café is browsing recipes by their primary ingredient. If you packed chicken, you’ll be able to find recipe options that primarily use chicken. For families that are RVing with kids that are picky eaters, it can help keep them happy! There are dozens of main ingredient listings, which cover almost anything you could think of. Use this site to find great options for your favorite types of food! When you’re camping, especially for longer trips, leftovers can be a huge timesaver. Instead of planning special lunches each day, cook extra portions of dinner and use the leftovers for lunch or breakfast. It lets you pack less and cook less – meaning more space and more time to enjoy your trip. That said, don’t overpack! Making the most of every inch in your RV is an important part of traveling comfortably. For newer RV owners, it can be easy to end up packing way more than you need. That’s where proper meal planning can save you a lot of time and money on the road. Pay attention when you’re making a meal plan for your trip. Some require specific pots and pans – like Dutch ovens or slow-cookers. The right ingredients won’t be helpful if you don’t have the tools you need to cook them! Find out about our recommended RV cooking essentials that every camper should bring along for their trips. If you’re planning to cook any of these recipes, one great trick is to sort your ingredients into plastic bags before you leave. This way, when you get to your campsite, you won’t have to cut, peel or organize your ingredients. Just grab the relevant bags for each meal and throw them together!